Voice of the Collector: TTM Hoops Collectors Will LOVE This! For those of you not familiar with The Autograph Card, you need to check them out. They have a variety of inexpensive, custom trading cards perfect for TTM and in-person signatures. New to their arsenal for basketball collectors are Floorboard cards. I love the innovation of this simple company as it was clearly started by a passionate collector, so I have no problem with promoting them with a shameless plug. I received this press release from them yesterday. "Many basketball fans who collect autographed parquet floor tiles are finding it difficult to locate tiles as many retailers and manufacturers are no longer stocking them. In response to many email requests asking for an alternative, The Autograph Card has come up with our newest item – The Floorboard Signature Card! This new card measures 6" x 6" and is professionally printed on a heavy 16-pt. card stock. Sharpies, Staedtlers, and even ballpoint pens sign great on them! One side features a full parquet tile. The other side has one panel of a parquet tile. It is up to you as to which side you get signed. This pre-order offer is only available to our current customers through this email for a limited time. 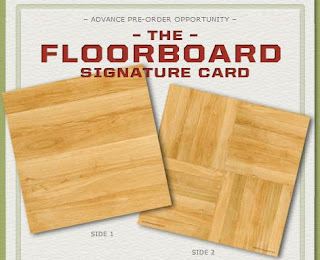 To purchase The Floorboard Signature Card click on the button below to go directly to our Order Form page. This offer is good through March 19, 2010. Orders will ship on approximately April 1, 2010. For more information and to view our entire line of cards, visit www.TheAutographCard.com."